Joy March 12, 2019 March 18, 2019 No Comments on Does Your Brother MFC 480DW Printer Leave an Invisible Tracking Code on Your Printed Document? Ever since people have started using printers with regularity, a certain urban legend has circulated regarding invisible tracking codes left on printed documents. In the hyper-vigilant era of Alexa, Siri, and facial recognition, it makes sense that this particular old myth has resurfaced. Even Snopes has addressed it, marking it “mostly true”—but there’s no reason to throw your printer in the lake and move out of the country. This metadata is likely harmless and will not impact your life or your business in any meaningful way. We understand your concerns. At first, the idea that everyone is theoretically being tracked by metadata used by their printer’s company is a bit disconcerting. But the reason behind this is simple enough: the majority of laser printers are designed with a feature intended to deter counterfeiting currency. Certain major printing companies do utilize this secret metadata which enables them to keep an eye on potential criminals. While we can’t guarantee that invisible tracking code isn’t appearing on your printed documents, it’s probably not worth panicking over. 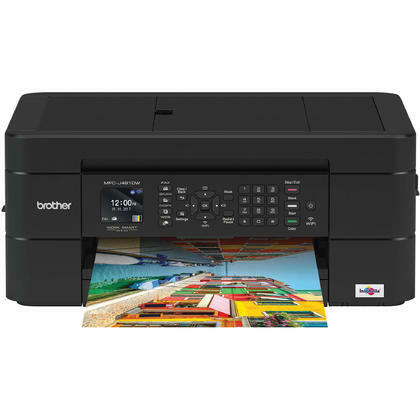 It’s currently unclear whether the Brother MFC480DW printer is tracking you, but even if it is, it’s unlikely that printing your undergraduate English Literature essay is going to make you a target for the NSA. The technology used to track when and where a document first gained prominence in 2017 when a federal contractor named Reality Winner leaked confidential government information—regarding Russian collusion with the U.S. election—to the press. Invisible tracking information helped reporters track Winner down and arrest her. Naturally, it’s a bit jarring to consider that the National Security Agency (NSA) is keeping an eye on any and all documents being printed—and that you could potentially be tracked down simply by a series of invisible dots left on your printer paper. However, the average person is not committing acts of treason at a high level in the U.S. government, or even, for that matter, printing fake money. This security measure that has helped prevent counterfeiting for many years and is unlikely to cause any harmful effects to you as long as you don’t engage in any illegal activities. Sure, it might seem a bit creepy, but it’s probably never going to affect you at all.